The word ‘smart’ has a new context, thanks to the tech boom. From ‘smart’ phones to smart homes, we’re seeing technology that promises to improve our living spaces and our lives. And that’s why now’s the time for scientists and consumers to think about what that future should look like. At a place like Virginia Tech, the future is practically history, when it comes to the world of smart homes. 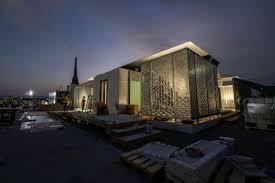 Almost a decade ago, its team won the solar decathlon for lumen HAUS, an energy efficient prototype, and just last yearVT took first place in a competition in Dubai, for its newest iteration, Future HAUS. Denis Gracanin is a computer scientist at Virginia Tech, who’s been working with Wheeler’s team on intelligent systems. Smart houses will depend on large arrays of sensors, analyzing data and feeding it back. And that's a lot more complicated that it sounds. But that's what makes a smart house so smart. Well, not just affecting the space, but improving it. Gracanin sees a future where houses actually help their inhabitants to deal with things like stress, mood, productivity, and more, so instead of calling it a ‘smart’ house’ Gracanin prefers the term “empathetic house. In the. 2012 Movie Robot and Frank, the smart and empathetic creature is robot, not an entire house. Frank is a fictional representation of what they call the senior tsunami, the wave of older people who might benefit from self-driving cars and smart houses. That is, if they don’t drive them crazy with complexity, malfunction, and the infamous condition when internet service mysteriously drops away. Or perhaps a simulated pompous attitude from a repetitive robotic voice. No matter how smart the sensors become, Gracanin says there should always be a human in the loop. ***Editor's Note: Radio IQ is a service of Virginia Tech.